Each year, thousands of gifted students go undiscovered in our classrooms. Without accurate identification, many of these students will never reach their full potential or benefit from the great resources available in our gifted programs. As teachers and educators in gifted education, one of our top priorities should be the screening, assessment, and identification of our gifted students. It used to be that intelligence and giftedness were solely based on I.Q. and test scores. As our understanding of giftedness and the brain has expanded, the means of assessing and identifying gifted students have also expanded. 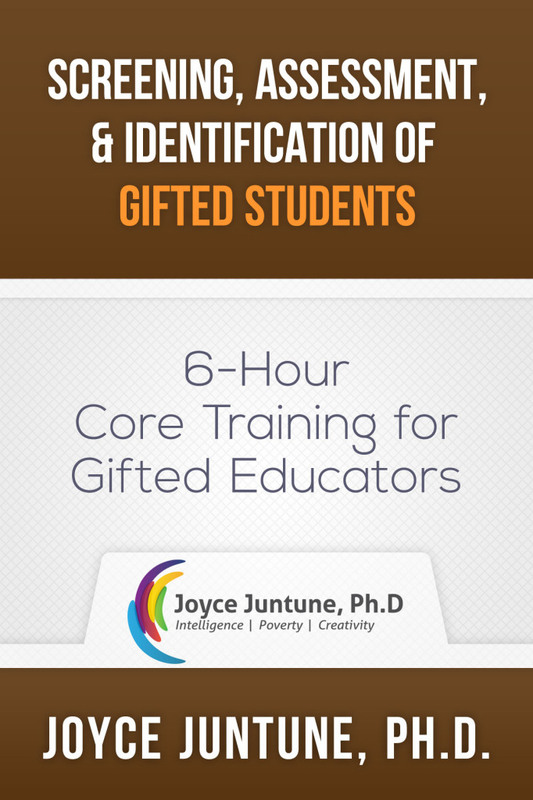 In this course, “Screening, Assessment, and Identification of the Gifted”, Joyce Juntune Ph.D., draws from her vast knowledge and experience in gifted education to present invaluable tools for identifying gifted students using a variety of different methods. This course is aligned with 2016 ODE Teacher Competencies e, f, g, and NAGC Teacher Preparation Standards 4.1, 4.2, and 4.3.